Each time you acquire a new client, they need to have a Licence set up within Operate, in order for you to subsequently be able to set up future records, communicate with them and bill for the products and services associated to their Licence. Licences ensure that all of the terms of your agreement are recorded within Operate and available at any time. In this guide, we will look at the steps to follow when you need to set up a Licence for a new client. A list of your Licences is available under Member > Licences, in the main navigation menu. This is also where you can create and update Licences when needed. Go to Member > Licences and click New. If this is the very first Licence within your system, click Get Started. Select the Location where your new customer will be based / where the space is being rented. Select the customer’s Account (Search and see if it has already been created) or create it now by clicking the “+” sign next to the dropdown. Select a Billing Contact or create one now by clicking the “+” sign next to the dropdown. This is the person who you will be contacting regarding any financial/billing issues. Select a main Contact or create one by clicking the “+” sign next to the dropdown. 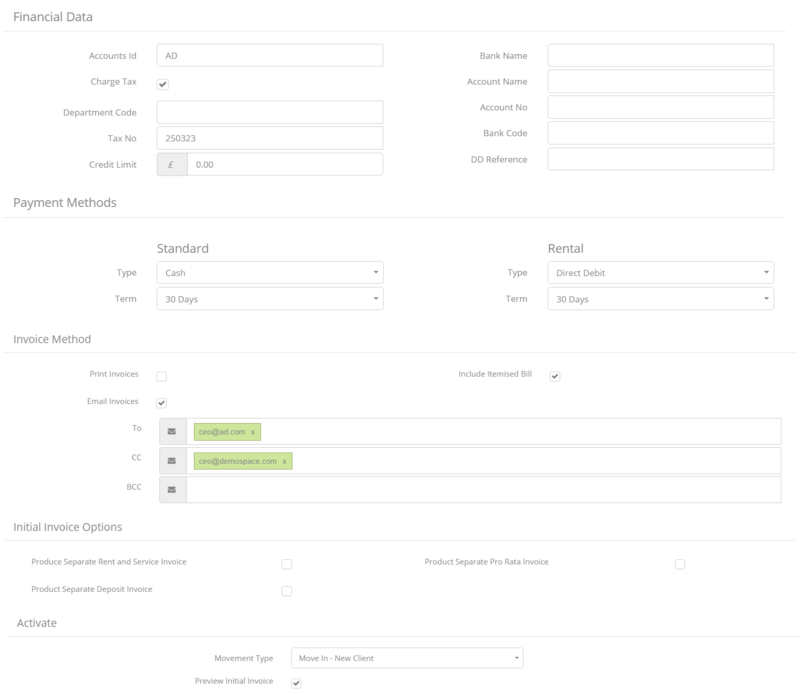 Select a Client Type - This will determine the rates you apply to this customer. Typically, Residential clients rent a fixed office space and receive lower rates for additional products or services; Club Members do not rent a fixed space, but are paying membership fees, Meeting Room clients are only booking meeting space for a limited amount of time; while virtual clients do not rent actual space, but only require and address and sometimes a phone number and additional services. Add a Description to identify your License by. Select a Licence template to use for this customer. Tick the box if the client will be paying via Direct Debit. Enter how many Parking Spaces the client requires, if any. Select the Sales Person who has acquired the client. Select an Opportunity Type - This is where you can select what is the essential stipulation of the Licence - e.g. : downgrade to a smaller office, renewal, upgrade or a new customer moving in. When setting up a new customer, simply select New Customer - Broker (if the new customer has been brought by a broker) or New Customer - Self Sourced (if you have had direct contact with the customer). Choose the Lead Source - This is where you can select how you have connected with this customer: e.g. : via a broker, your own campaigns or your website. Notice the Status - At this point, the Licence will be a Draft. Select the person who has approved the Licence. If your agreed Licence Term is limited to a certain amount of time and will end at a specific end date, it will either end completely (if the customer does not wish to continue) or it will be subject to renewal. In this case, all you need to add here is your start and end date. The number of months and days will be automatically filled out, based on these dates. If your contract is rolling, please check the corresponding checkbox under the License Term. In such a case, your contract ends whenever one of the agreeing parties decides to end it and not on a specific date. Instead, it is necessary to add the date when the Licence will be reviewed. This section allows you to manage the timings needed for parties to provide a notice before terminating the contract. Here is where you can add the standard number of months needed before the license is ended by one of the parties. For a new customer, you do not need to select dates for when the notice has been given and when the customer is expected to move out. You can get back to the Licence and select them if and when a notice is given. If you chose to use break dates, you can then select one or more dates on which the contract can be ended, before the actual end date that has been set within the Licence Term. You can associate a Notice Period to each break date. In addition, you can check the Rolling Break Dates option if the Licence can be terminated any time. If you tick the box to auto renew the Licence, it will renew itself for the amount of time you set. In addition, you can decide whether the renewal comes with a price increase or not. To auto renew a licence, check the corresponding box, set the date when you would like the Licence to renew, then select for how many months. The auto renewal process automatically runs system wide, on a daily basis, processing all licences that are set to renew on that date. The auto renewal will look at the end date of the licence and will also look at the notice period which has been assigned to the licence. If the end date – notice period = a date which is within the same month as the renewal date of the licence, then the licence will be renewed using the criteria specified in Operate. If the date is not in that month then it will not be renewed, it will wait until the renewal date is of the same month. A renewed licence does not need to be terminated. On the renewal date, Operate will process it automatically. The Rent, Virtual services and Contract services will be extended. The Licence End Date will be extended as well. Operate will process the automatic renewal on the same Licence record, without generating a new one. The new end date now becomes the next review date as well. Read more about renewing Licences. If you do not want to increase the price, all you need to set up is the renewal date, the number of months with which the contract is extended; and make sure that No is selected under Price Increase. If you chose to increase the price by the renewal date, first enter how often you would like the price increase to occur after the renewal date (in months). Next, add the percentages by which you would like to increase rent, services and virtual charges (for virtual customers). Tip: if your Licence is set to auto-renew for a shorter period than 12 months -you will probably want to ensure the escalation is not using the renewal date unless the goal is to increase the licence more frequently then annual. If you decide to increase pricing after an escalation date, first select the date after which you would like to increase the prices, then enter how often you would like the price increase to occur after the renewal date (in months). Next, add the percentages by which you would like to increase rent, services and virtual charges (for virtual customers). Please Note: In both situations when the price is increased, only items on licences which are marked as Auto Escalate will increase in price. Here is where you can add your client’s billing address, as well as their registered office address. You can copy the registered account address or the site address, corresponding to the location where they are renting space. Your licence is now set up and you are ready to add the services that you will be providing to your customer. Please note that the licence will not activate, unless you add services to it. When you are ready, simply Save your Licence to finalize your new client setup. Your Licence is now saved; however, it is a draft until you activate it. Before activating, Operate has set up a check list system, to help you keep track of all the necessary documents to receive in order to ensure that the contract is properly set up. Therefore, when you receive a specific document, click the Check List button in order to add it. Please set the licence signed date and tick all items which have been received. Once all items are received, the licence can be activated. When you are sure that your setup is complete - that you have added all of the needed information and associated Licence Services, you are ready to activate. To do so, use the Activate button, found on the right side of your screen, next to your licence details. Add Financial Data - Here is where you can add account and tax related information, set up the customer’s credit limit and add bank related details. Set up a Standard Payment Method, to be used with all charges except for rent. Select a Payment Term - either immediately or within 30 days from the date when the invoice has been issued. Select Invoice Methods - You can choose to either print or email invoices. When emailing, you can choose who should be notified, using a main To field; as well as a CC and BCC field. NOTE: If you do not select anything in this section, the invoicing will be done for all of these charges together, on one invoice. Activate the Licence by selecting a movement type - In the case of a new customer, you would select Move in - New Client. When you are ready, click Activate Licence at the top right. Depending on whether you have selected to preview your initial invoice or not, Operate will either show you your Invoice or take you back to the list of Licences. If you select not to preview, your invoice will be available under Invoicing > Draft Invoices.